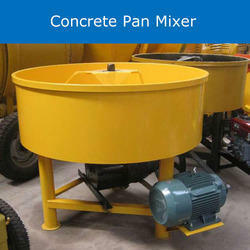 Our firm Golden Hydraulic Industries engaged in manufacturing and supplying a wide range of Pan Mixer Machines. The high-grade raw material is procured from the authentic vendors of the market to manufacture these machines in adherence to set industry standards and norms.Our offered machines are widely demanded their features like durability, reliability, sturdy construction, low maintenance, and easy handling. In order to satisfy the diverse preferences of our valuable patrons, we are offering superior quality Industrial Pan Mixer Machine. The provided machine is widely acknowledged among our patrons owing to its high functionality. This machine is perfectly manufactured according to the set industry standards at our well-equipped manufacturing unit using superior grade components and pioneered methodology under the stern vigilance of our adept professionals. Furthermore, this machine is properly inspected against set parameters to ensure its functionality.